"The people, the wines, the food and the scenery were more than what we expected." 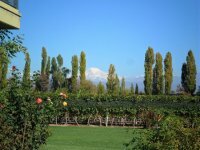 An exciting tour through Luján de Cuyo, the most important wine region of Argentina, where we will visit unique wineries such as Kaiken, Vistalba, Dominio del Plata and Achaval Ferrer. "It truly was one of the best trip I have ever made"
We will enjoy a delightful tour visiting some of the most impressive wineries of Luján de Cuyo and Maipú: Lagarde, Bressia, Melipal and Domaine St Diego. "Thanks again for the wonderful tours"
A unique tour with great wineries to visit and a different option for lunch: a delicious picnic, in the garden of Dominio del Plata winery. "Each of the vineyards we visited was special for different reasons." Luján de Cuyo is one of the most important wine regions in Argentina. It is located 20 km southwest of the city of Mendoza. We will visit two of its most representative wineries: Bressia and Achaval-Ferrer.